The costs of the wave of asylum seekers arriving in Sweden due to the refugee crisis will be much greater than previously expected, forcing the government to earmark more money in the coming years. 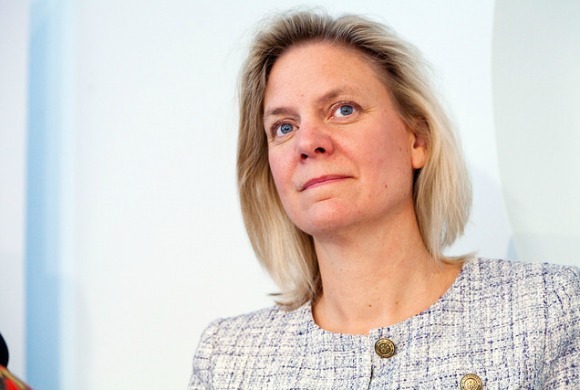 Sweden’s Finance Minister Magdalena Andersson on Wednesday (13 April) presented the centre-left government’s 2016 spring budget, which revealed that the Scandinavian country expects costs related to migration, such as providing accommodation and offering job training, will be close to 56 billion Swedish crowns (€6.1 billion) per year until 2020. The government had previously forecast 15 billion Swedish crowns (€1.6 billion) annually. However, Andersson was upbeat about the current situation of Swedish economy. During a press conference she highlighted that the economy grew almost 4% in 2015, the 6th highest pace in the world. At the same time, the unemployment rate of 6% is the lowest in seven years – although Sweden is unlikely to have the lowest rate in the EU by 2020 as Prime Minister Stefan Löfven promised during his general elections campaign in 2014. Sweden took in around 163,000 asylum seekers in 2015, the highest number per capita in the EU. The country is expecting around 75,000 people to arrive this year although this figure remains highly uncertain. To deter refugees and migrant from travelling to Sweden, the government in November last year implemented stricter regulations for residence permits and family reunification, as well as set up temporary external border controls which will expire on 8 May. In order to finance the extra costs related to the migration policies, the government coalition of the Social Democrats and the Left Party will introduce higher taxes on alcohol, but also cut development aid funding by €440 million a year. “Sweden takes a very big responsibility in the world and has one of the highest development aid contributions and therefore, I believe it’s justified that we reduce aid to cope with this situation,” Andersson said. Ulf Kristersson, the spokesperson for economic policies from the biggest opposition party, the conservative The Moderates, slammed the proposed spring budget by saying that the government still did not fully understand the challenges the Swedish economy is facing due to the refugee crisis. He claimed unemployment rates will undoubtedly rise in the years to come. “We are running out of options to fend off a recession. This economic situation is not sustainable,” Kristersson told the TV broadcast SVT. Oscar Sjöstedt, a spokesperson from the far-right and anti-immigration party the Sweden Democrats, accused the government of focusing too much on immigration and not investing in welfare policies. The Swedish Central Bureau for Statistics (SCB) said in a seperate statement on Wednesday that the increased number of people coming to Sweden means that the country’s population is likely to reach 10 million people in 2017. This is a year earlier than previously expected. The main reason is that the SCB expects that 857,000 people will be moving to the northern European country over the next five years. The statistics bureau expects 287,000 people to leave Sweden during the same period. The SCB said that its forecast is still quite uncertain as both the number of asylum seekers and the number of people granted permanent residence permits will be affected by future political decisions taken in Sweden and at EU level. The EU struck a deal with Turkey in March to swap one Syrian refugee from Turkey for every Syrian they sent back from Greece. The pact, which included a six billion euro aid package for Turkey, would stop refugees risking their lives to cross the sea from Turkey to Greece. They would not have to rely on vicious people smugglers as they would have alternate, legal ways to get to the EU, the Commission argued. Since 4 April, 37 Syrians were resettled to Germany, 11 to Finland and 31 to the Netherlands, the Commission said. EU leaders in September 2015 committed to relocate 160,000 people from Italy and Greece by September 2017. Coming week: Swedish opposition parties to present an alternative spring budget. There you have it .Decrease lifestyle for Swedes and an ever increasing tax load. Eventually the tax load will become unbearable for Swedes. Eventually Swedes will have to consider emigrating themselves to another country that appreciates their skills.The only thing that will change is that it will get worse. And that boys and girls is how you conquer a whole country with little to no effort of course with the help of corrupt people and traitors to their own countries like merkel or the swedish 1st minister, muslims have been saying for the past decade “we won’t need to bend a single sword to conquer the west” how true it was, and they aren’t even that smart, their actions are so predictable, it’s just that traitors are opening the doors while people sit at home doing nothing waiting for their country to be the next to be conquered. Maybe they deserve it.